The Venta Water Treatment additive (WTA) is a supplementary liquid solution designed to maintain hygienic conditions in the lower housing of the Airwasher. The WTA improves evaporative efficiency, kills mold and bacteria trapped in the reservoir, and prevents mineral deposits from forming in your Airwasher. It's simple it's all in the paper. Our wicks contain more paper than the competition. The quality of our paper has greater absorbency, lasts longer, and requires less energy to provide the same amount of humidification as the competition. The 1043CN SuperWick is made right here in the USA under our high quality control standards. Crane Humidifier Filter . Helps reduce white dust, which is a byproduct of minerals caused by hard water. Crane Humidifier Filters also feature Antimicrobial Material to help reduce mould and bacteria growth. For best results, replace filter after every 30-40 fillings or every 1-2 months under normal use, or when the humidifier has not been operated for an extended period of time. To install, simply replace tank cap with filter and insert into full water tank. Place full water tank back on the water basin and wait fifteen minutes for the water to pass through the filter before starting the humidifier. Fits most Crane Humidifier Styles including Adorables, Drops, Droplets, Smart Drop, Cube, and Warm Mist. 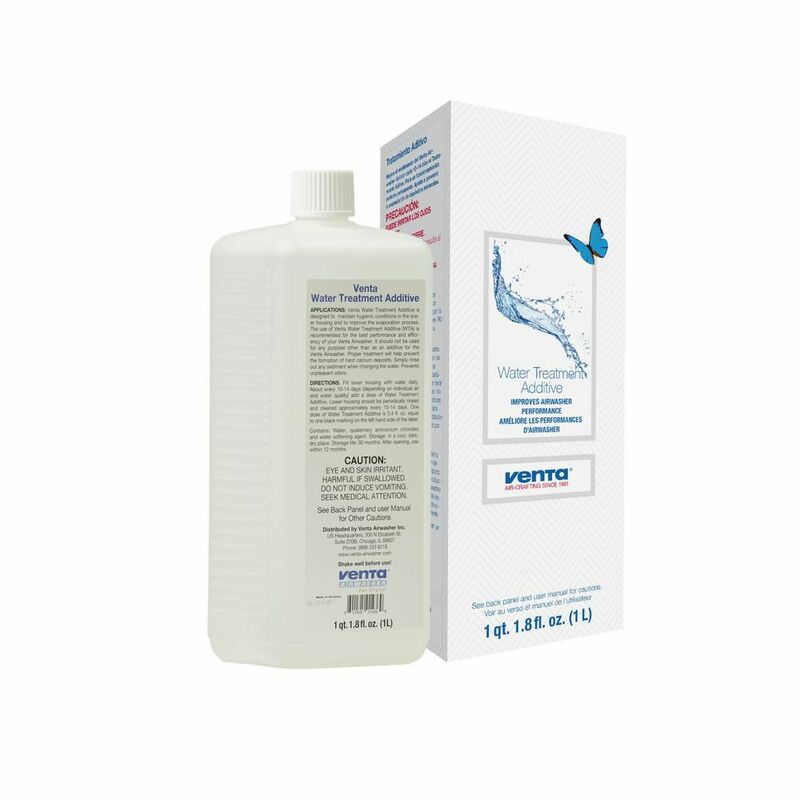 Venta Water Treatment The Venta Water Treatment additive (WTA) is a supplementary liquid solution designed to maintain hygienic conditions in the lower housing of the Airwasher. The WTA improves evaporative efficiency, kills mold and bacteria trapped in the reservoir, and prevents mineral deposits from forming in your Airwasher. Venta Water Treatment is rated 4.8 out of 5 by 12. Rated 5 out of 5 by HomeDepotCustomer from Very easy to set up and get running. Excellent humidifier!... Very easy to set up and get running. Excellent humidifier! Rated 5 out of 5 by J810 from I had the product shipped to the store and it was fast and easy to pick it up. Treatment is what... I had the product shipped to the store and it was fast and easy to pick it up. Treatment is what Venta recommends for their humidifiers. Works well. Rated 5 out of 5 by Stana from This additive is the best way to keep your Venta long lasting and air clean. The Home Depot shipp... This additive is the best way to keep your Venta long lasting and air clean. The Home Depot shipping was quick and pick-up pleasant and simple. Rated 4 out of 5 by Bob from Necessary for equipment.... Necessary for equipment. Rated 4 out of 5 by Edward from Works nicely, but for where we live it's not quite... Works nicely, but for where we live it's not quite capable of maintaining much more than 20% relative humidity. This is a very dry area, though, and it does help. I frequently supplement it with a kettle on the stove. I like it because it's easy to maintain and helps clean the air.